Pursuit. Seven or eight white shirts pushing in unison to make sure Adrian Peterson knew where the ground was. Swatted passes. Textbook tackling, using the arm, shoulder, and helmet. Hardly anyone out of position. More pressure on the forty something. Who coulda’ woulda’ shoulda’ thought the Saints can win a big game by scoring 14 points? In a league that has tried to rule it out of style, defense ruled in the opener. The Nation is safer for it. Defensive coach Gregg Williams and his Corps of Engineers have apparently firmed up the levees. And Souls Of The Saints absolutely loves it. In a bloated media bubble that had burst hazards for the home team, the Saints acted like defending champions because it wasn’t pretty. Garrett Hartley has a strong leg, but until harnessed, cannot be relied on to win games. Nor should he be, as much as Morten Andersen was, back in the day. This is a far more versatile team than those were. The receivers did come down with a case of the drops, which got aggravating. Mick Jagger was not known to be in attendance but may have been watching and partying from afar, while the Stones Of The Saints offensive line mowed over another opponent and took control of the game in the second half. Pierre “P.T. Cruiser” Thomas was again the beneficiary, manuvering between lanes on the expressway. Left tackle Jermon Bushrod will be getting texts all year from fellow offensive linemen in the league, them wondering how he was able to muffle sack specialist Jared Allen for two big games in a row. Barring injury and other calamities, opponents all season will learn that the Saints have plenty of manners in which to diss them, and leave them wanting at the dinner table. Former Country Day teammate Mick Berry’s father Dan owned Pelican Ice Co. in New Orleans, who gave some of us summer jobs during high school. I received a major employment benefit one night in the form of a vendor’s sideline pass, allowing me to stand on the sidelines when the Saints hosted the Steelers on Monday Night Football. In an overcoat on a cold night, I got to stand just feet away from The Steel Curtain when they warmed up, noticing their defensive coach, George Perles, have them do so only sluggishly, which I thought was wise, since over-doing it in warm-ups is not uncommon in football. I cannot relay the exact off-color of L.C. Greenwood’s shoes. But I do remember Lynn Swann scoring his first pro touchdown, as a rookie, on a punt return, which I reminded him of when briefly shaking his hand years later. That the Saints never put up much of a fight, and that I was no Steelers fan then or now hardly mattered, and suffice it to say that this kid was in Football Heaven. Most memorably, the speed and velocity of the pro game from the sidelines does not resemble much of what you see on television. Sometimes I wonder how coaches can even see what’s going on out there, and take it all in. Mick is a published author and resides in San Fran, where he reports he will ride ‘da bus and go to Monday Night’s match against the 49’ers. Him warming up at an equivalent of a Black & Gold Voodoo Lounge with other members of The Nation is a high likelihood. I have a feeling his experience will be superior to my one visit to old Candlestick Park, during the Jim Mora years, when nobody traveled out there expecting the Saints to win, just to enjoy the city that resonates with some of the feels of New Orleans. The place was a converted baseball field, some sections were unusable insofar as seeing the field, and as the Saints went down, I was sitting amidst loud, repetitive, monotone chants of ‘Niners! by countless, bearded, red-shirted grunts from behind who knows where in the redwoods, resembling a bunch of stand-ins from the old ZZ Top videos. But the time I had at the Stars bar and restaurant the night before made up for it. Odds are the Saints will score more than 14 points Monday, and Mick can leave the stadium holding up two fingers, not to imitate Richard Nixon or a West Coast hippie, but as in 2-0, and Two ‘Dat. Mick wrote me, besides making a comment under Purple Things First, intimating these Saints could become a period dynasty team, similar to the new millennium Patriots, or the Cowboys of the 90’s. It felt foreign to read the word Saints along those lines, and I wondered if Mick had turned into a Crazy Cube of sorts. I am not doubting his relay after seeing the team play defense like it did against the Vikings. He sees the light, and his reasoning is on solid ground, even if that in all of the state in which he lives, isn’t. Thanks Mick, and Mr. Behre, for that Monday night, many moons ago. ‘Dis One’s For You. 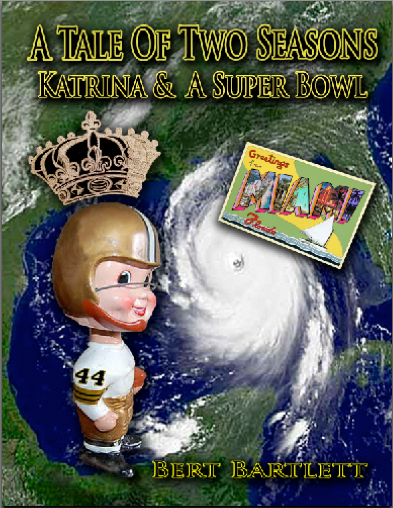 Posted in Uncategorized.Tagged 49'ers, A Tale Of Two Seasons, Black & Gold, Candlestick Park, Crazy Cube, Dalton Hilliard, ESPN, Garret Hartley, George Perles, Gregg Williams, Hurricane Katrina, Katrina & A Super Bowl, L.C. Greenwood, Lynn Swann, Metairie Park Country Day, Monday Night Football, NCAA, New Orleans, New Orleans Saints, NFL, Pelican Ice, Pro Football, Reggie Bush, Richard Nixon, Saints, San Francisco, Steel Curtain, Two Dat, Voodoo Lounge, Write2grow.org, ZZ Top. Remember what a dump “Matchstick” was back then? Didn’t even have decent plumbing in the restrooms; I hope they at least got that fixed. And, as you say, the Who Dats against those particular ‘Niners didn’t give us much cause for celebration. And I was facing a long drive back to Bakersfield that evening. I do recall some really cute dancers/cheerleaders, though. Red spandex leggings and white sweaters.